This essay first appeared in the pamphlet Anna Hepler: Bloom (Suyama Space, Seattle, Washington, 2011), which accompanied an exhibition by the same name. It was reprinted again in the extraordinary compilation Suyama Space 1998–2017 (Suyama Space, 2017). 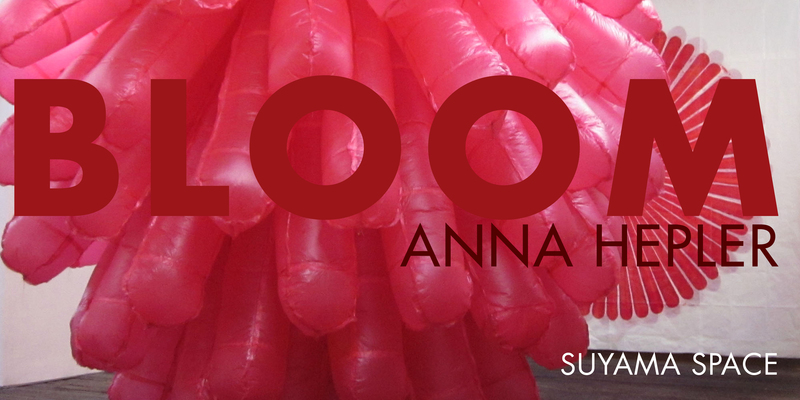 To address Anna Hepler's Bloom is to address breath: both as a metaphysical material of the active imagination and as a physical material in the artist's hands. In a very real sense Bloom is a living object, a giant heart or lung, transforming Suyama Space, by extension, into the body of some grand architectural Leviathan. As we journey into the chest of this creature, we are rewarded with an unforgettable experience—one that is at once mirthful as we search for analogues in tide pools and tantric verse, dizzying as we try to empathize with its impossibly long breath cycle, and enigmatic as it both suggests and ultimately defies the intimacy of any known corollary. Over the past decade, many of the installations in Suyama Space have consisted of static objects, changing subtly, often sublimely, in concert with the building through the shifting of sunlight, temperature, humidity, and the relative occupancy of the space. By contrast, Bloom is itself in constant flux, continuously changing in size and volume as it inflates and deflates. As a consequence, the installation destabilizes our perception both of the static nature of the building that houses it and of our shared occupation of that same space. 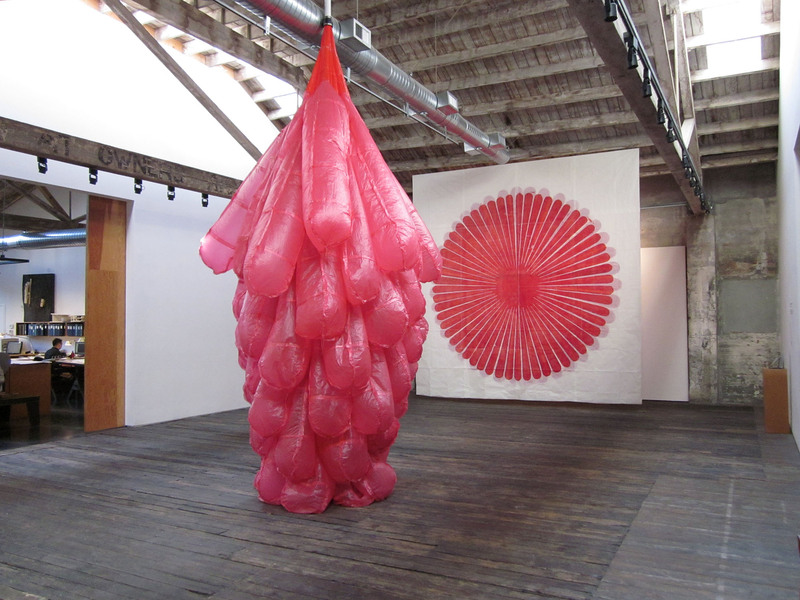 When I entered Suyama Space to watch Bloom inflate for the first time, the piece was hanging from the center of the ceiling, deflated, disheveled, and oddly cadaverous, the bottom of it splayed out on the dark floor. As it began to inflate, the structure of the form began to appear: a mass of tubes projecting radially from a central sphere. Here and there, surfaces captured rays of sunlight streaming in from above, the now-glowing tubes looking like the tentacles of a sea anemone. As it inflated over the course of about fifteen agonizing, wondrous minutes, I found myself forgetting to breathe, my own lungs seeming to empathize with this otherworldly object as it struggled to reach its pneumatic climax. Caught in the mesmerism of the swelling form, I experienced many emotions: delight and wonder, as well as a yearning that is difficult to place. But also, most dramatically, I felt anxiety. The experience was so powerful, that even now, as I write these lines and think about that long inhalation, I find myself holding my breath again. Two moments in the process of inflation were particularly compelling: the first was when the entire form lifted off the floor and the slightest movement of air caused it to twist and sway; the other occurred at the very last moment of inflation, when the tubes quite suddenly became fully erect and, in a most fecund manner, jubilantly pointed in all directions, some of the tubes actually appearing to battle the giant trusses and HVAC ductwork that span the space. And then the air blower switched off and the piece began to deflate. I was surprised by the extent to which the deflation was defined by sound. 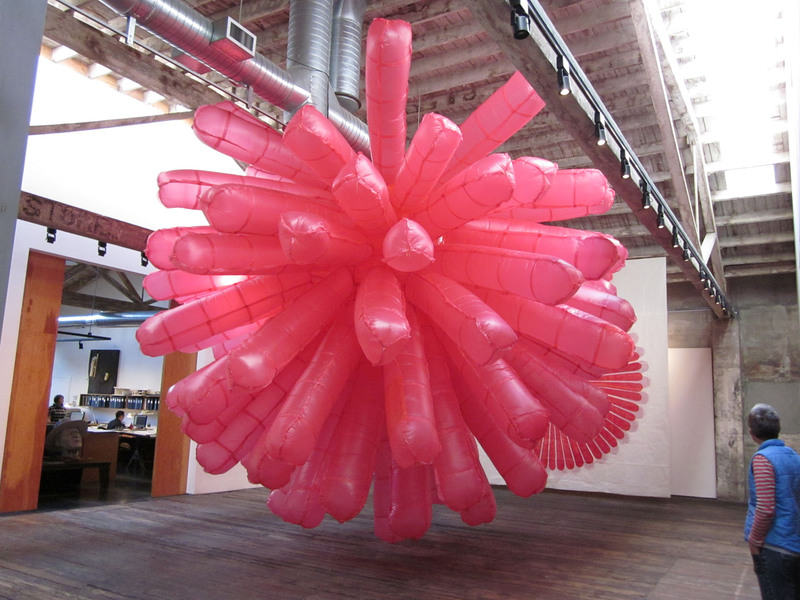 The piece is made of nearly one thousand pink plastic bags sewn together and taped at the seams. As Bloom deflated, the plastic began to crackle, sounding almost like static electricity, and a faint whistle of air blew through small holes. The tension of the room dissipated abruptly as if something huge had relinquished its hold and moved on. While the piece was inflating I had lodged myself in a corner of the room; now, as it deflated, I found myself drawn into the center of the space as if by an invisible gravitational pull. In the after-deflation of Bloom, the south wall was fully revealed, and in front of it hung a huge woodblock print (measuring 16 by 16 feet), which Hepler describes as a blueprint of its inflatable counterpart. It occurred to me that Bloom could be understood as a three-dimensional mandala for meditating on volume and its permutations. There exists a long and illustrious tradition of meditating on one's own breath, and this new mandala seems to access that tradition with an accidental panache. A few minutes later, when Bloom began to inflate again and obscure the woodblock print, I was prepared. This time, I began to visualize my own breathing, finding my own epicycle of breath inside the longer cycle of Bloom. The artists invited to exhibit at Suyama Space are asked to respond to the site itself—to engage, challenge, and contribute to the pattern language of the installation space and the building as a whole. Suyama Space is akin to a closed central courtyard, separating the front entry room that faces the street from the architectural offices located in the back half of the building. To access the offices, one must traverse the installation space. That traverse—the movement from public to private realm—has influenced many of the installations over the years, and Bloom is no exception. The inflatable structure is placed more or less directly in the center of the room and between the doors, disrupting the otherwise direct path to and fro. But it does more than this. In the process, Bloom becomes a momentary destination along that path. As it shifts in size (from less than six feet in diameter when deflated to more than twenty-two feet in diameter when inflated), so too must the path around it change. And because in its inflated state Bloom moves with the slightest bit of air current, the passerby not only actively influences the way the piece occupies the space but also becomes an agent partially responsible for Bloom's animation. For a brief time, Bloom becomes a monstrous dance partner.And part of Bloom is truly horrific. This horror stems from its being made of plastic. As Hepler described to me, “Plastic is really gross to work with: it lacks any material sensuality. Working with it is like engaging a karmic black hole.” Thus, the piece presents an unexpected fusion of material: breath is the antithesis of plastic. Doesn't every plastic bag carry a warning about suffocation? And beyond the dangers of a single bag looms the very real concern about the horrific bloom of plastic in our oceans, literally suffocating the greatest lung on our planet. Bloom can be understood as an ominous and grotesque phoenix that has risen from the great swath of plastic we are relentlessly excreting over the Earth. Bloom's complex exploration of the relationship between breath and its denial manifests in Suyama Space itself. We tend to think of windows as means for introducing light into buildings. The word “window,” however, derives from the Old Norse word vindauga, meaning “wind eye.” Long before glass, vindauga were the orifices of a building through which air flowed. The moment a window is placed in a wall, the interior of a building becomes a lung. With the exception of two lines of skylights, there are no windows in Suyama Space, no apparent means for breath. And in some respects this lack gives Bloom an atavistic power—it provides a lung to a windowless space. As it expands, one feels it palpably as unwieldy psychosomatic conjugations of pressure and emotion, material and dreams, the self and the other. Until I experienced Hepler's installation I had never consciously articulated breath or air as a material, especially as a material for the artist or of the imagination. I think this has to do with the fact that it is more or less invisible—like silence that allows music to come alive. Also like silence, breath does not appear to have an edge, an inside or outside; its agency is ever-elusive and permeates everything. But the link with creativity is undeniable. In fact, breath forms the very basis of the most transcendent aspects of ourselves. In Chinese it is qi, in Greek pneuma, in Latin spiritus, in Sanskrit prāṇa. All of these words are found at the ontological center of a variety of religious and philosophical systems, and all of them refer to breath and, by extension, the nonmaterial energy that flows through us. The idea is also present in our everyday usage when we say, for instance, that something is “inspired,” which means quite literally “breathed into.” It seems that the highest praise we can offer is to confer breath itself. 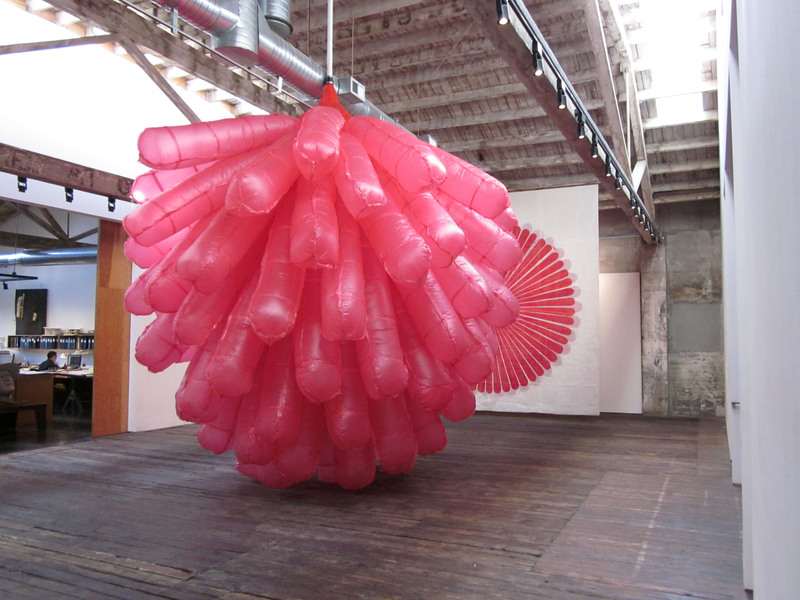 Once conferred, a curious shift occurs: inflating and deflating, Bloom becomes more phenomenon than object per se. The nature of its movement becomes far more evocative and lasting than the structure itself. Hepler displays some genius (laced with considerable humor) in dissolving the boundary between the two. Bloom is like a personal invitation to the viewer to share a breath with the ethereal. When we parse breath into inhalation and exhalation, the oneness of breath becomes two. How quickly and effortlessly, then, the rest of the world follows.